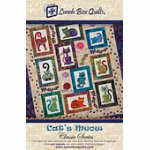 Whether you are a cat lover or know someone that loves cats, this quilt pattern is a must have Pattern includes full size patterns for use with your favorite appliqu technique. To be used with Cat's Meow Digital Pattern QPCMDD and MarkaBlock Cat's Meow MBCM1. Does not include digitized patterns. Pattern only.